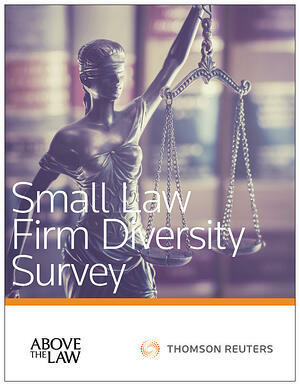 Download "Small Law Diversity Survey"
Whether all law firms, regardless of size, should consider issues of diversity in recruiting, hiring, and staffing decisions. Whether diversity is a competitive advantage for small law firms. Is it inappropriate for potential clients to consider a small law firm’s diversity when making hiring decisions? Our findings reveal a very widespread sentiment in favor of the ideas that law firms should consider a diverse candidate pool in recruiting and that diversity is a competitive advantage for small law firms. However, not everyone agrees, and skeptical points of view are included in our Report as well. *The Small Law Diversity Survey report will be delivered via e-mail. Fill out your email address accurately to ensure you receive it immediately. By requesting "Small Law Diversity Survey" you are opting in to receive communications from Thomson Reuters.